This is a Fashionista Event and a promotional item was provided to me by Coupons.com. Hosts for this event are Still Blonde after all these Years and ModlyChic. Pricing reflected below based on current prices at the time of posting, and are subject to change. Momma Told Me: The last person a wedding is about is the bride. The average cost of a wedding in the United States, in 2013, was recorded at 25k, with the range spanning $18k-$31k, and the median of couples shelling out $10k. Let's just let that sink in for a moment. Where Honey Boo Boo lives, in Georgia, that's 1/7th of the cost of a physical home (or a heck of a down payment!) So it's easy to understand why the beautimous Anna Shannon wanted to look flawless without being penniless, as she prepared for her big day. The Here Comes Honey Boo Boo star recently revealed her $212 Light In The Box dress on the August 14, 2014 TLC finale. With the rising cost of weddings, the expanding range of catering offerings, an the exorbitant booking fees of venues and bands, it's understandable the modern bride might feel push to compromise her dream gown for extras that more so impact her guests. 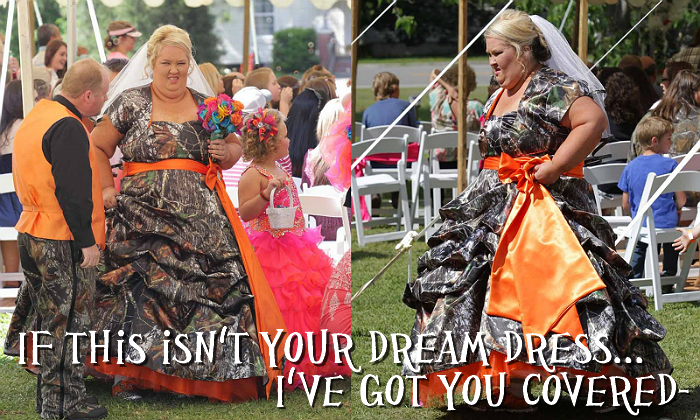 But you only get married once, or at least you only ever intend to, so why note bust out with Mama June's camo-print ball gown and let the guests dine on cheese puffs; it's your day darnit! Thankfully Light In The Box coupons easily pair with the already everyday great deals on wedding fashion and more to help budgeting brides look their smexiest, erm, most radiant on their big day. Scroll Over The Image To Reveal The Fashions And Their Links! In honor of Anna Shannon's wedding, and the finale which aired August 14th, I've spent some time scouring the wedding items from Light In The Box to create 3 vintage inspired bridal looks, all under $300. I know, you're a little skeptical; after all, you're no Mama June when it comes to couponing, right? Thankfully Light In The Box has it's own savings built directly into the website listings, which span everything from faucets to bridal bouquets, as they ship direct from the manufacturer to over 200 countries. That makes the iconic A-Line Bateau Knee Length Satin Wedding dress in my Fierce Fifties fashion a no brainer for the bride who prefers the refined, elegant, look that emulates starlets of the era. Making a nod to the seventies, the modern Flower Child bride will love the romance of gentle lace accents and a flattering trumpet hem. Paired with a sheer Cathedral Length Veil and Cascading Silk Bouquet of Lilies, it's the finer details in this fashion which take a nod from Princess Kate and traditionally elegant beauty. For brides with long sweeping trains and rich Mermaid flares, I suggest comfortable flats that express the theme of the event without having to don the Bamm-Bamm look at your own wedding. Finish the ensemble with delicate lace gloves and large synthetic pearl earrings, which will help keep your budget in line, and prevent needless worrying when one inevitably falls off during the second round of The Chicken Dance. Last, but not least, one of my favorite Vintage inspired wedding ensembles, inspired by the Roaring Twenties. I'll admit, slimmer profiles can pull this off best, but don't let the gossamer draping fool you; any bridal budget can afford attention to detail with this Sheath Halter Lace Wedding Dress from Light In The Box. Because of the stunning beauty of this gown, accessorize lightly, with a loose up-do accented by a hand-beaded headpiece and delicate pearl jewelry. Finish with a simple pair of satin pointed pumps and be ready to turn heads on your wedding day; just keep your hands out of the cheese puffs until your honeymoon night! Use these exclusive coupon codes through September 5, 2014 to save even more! Which vintage inspired Light In The Box wedding look is your favorite? How did you budget wedding costs? What Daughter Says: Don't let the budget make you Bridezilla, keep the focus on you with affordable fashion, and yes, even wedding dress coupons. Yes, it just goes to show you can have a wedding on any budget. Wow! Light in the Box looks really cool. I wish it had been around when I got married 11 years ago....and fingers crossed that it is still around when my girls are ready to get married. The cost of a wedding is ridiculous these days! The Roaring Twenties look is my favorite! I definitely believe in saving on the wedding dress, no need to spend a ton of money to look fab. The Fierce Fifties is my favorite vintage look. It would be perfect when hubby and I renew our vows. It's hard to believe that you can buy a wedding dress for under $300, but these designs are beautiful! I love the Fierce Fifties dress! 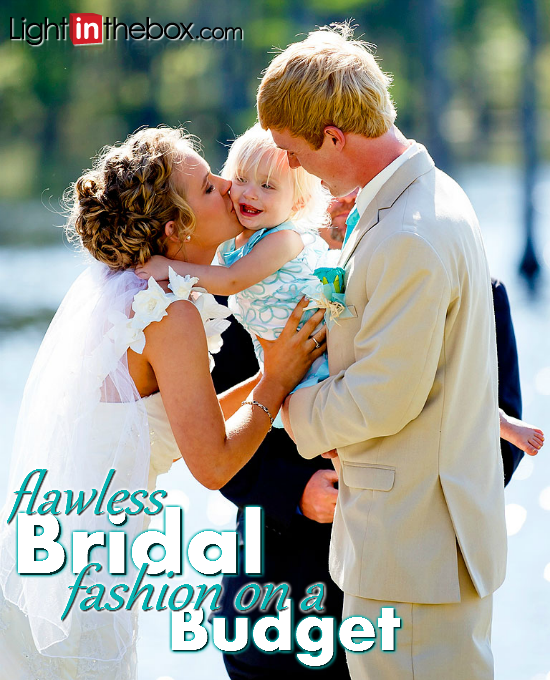 This is awesome that peole can save so much on a weddign dress. THey are beautiful and affordable! Wow the prices are amazing, especially for how beautiful their dresses and accessories are. I love it. I notice you ignored the '80ies in your look back. Why is that? There are a lot of beautiful gowns at Light in the Box - it was fun to look through them all. That is pretty awesome - my wedding was super simple and I have been scared even to look at how much everything wedding related costs. But there is a light at the end of the tunnel, ah? I like your compilations! My favorite is the Roaring Twenties....if only I had the figure to fit into that style. I can't get over their prices. I like dresses with lots of fluff. The fluffier/fuller the better! They have some stunning dresses at great prices! Truly I dont think I have ever seen Wedding dress coupons..and why not. The ensembles you created with Light in the box of various themes convinces me all the more that insane amounts of money do not need to be spent on a dress. Loved the roaring 20s one. Sounds like a really affordable option for brides on a budget! I like the Roaring Twenties look. We didn't really think about budget when planning our wedding but looking back, we probably could have saved a lot! My sister-in-law spent over 20k on her wedding. Makes me totally cringe because they didn't stay married even 3 years.. :/ She's dating someone new now and they plan to get married and I'm just HOPING she will go budget friendly this time. WEddings are not cheap but if you are ready to do the research and work they can be a lot cheaper than you think. Oh, I love the 50's - and yes, weddings can get crazy. I kept mine under budget but it's still a good chunk of money. I would so eat up the 50's style! I love their prices. It almost makes me wish we could get married again! ALMOST. lol. But I love their style. I might buy some accessories just for fun. Okay, so the camo dress is definitely not my style. I love that those looking for dresses can do it on a budget. It would be so much more fun to put that money towards the reception or honeymoon! My daughter's friend bought her wedding dress on Lightinthebox. It was absolutely beautiful! I am trying to get the picture of June's dress out of my mind! I love the roaring 20's from Light In The Box. I truly love the vintage look. I am a Victorian/lace kind of girl. I think this kind of site is great! Why spend so much money on a dress you will only wear once?! I don't think I can pick one -they are all beautiful. Great way to stay on budget! Yeah... I think I'd say no on the camo dress. I love Light in the Box, though. It's nice to see a company that doesn't gouge brides on their special day. Light in the Box looks great. I didn't go crazy for my wedding, and I still looked great. You don't have to spend and arm and a leg to look beautiful. These dresses look so beautiful. I love that they're affordable as well. Beauty and affordability. Go Light in the Box! What a great site!!! Loved the photos! I love the flower style!! The cost of weddings is insane now!! I love the prices on these dresses. Oooh the 50s look is exquisite and pretty. Love lace! I love the roarin 20's look! My wedding dress came from a second hand vintage shop and helped me keep the cost down. I love the 20's look - so long as there's a very (very!) tight corset one can find me LOL. It's truly gorgeous though :) thanks for sharing! The loaded nachos I tasted at Chicago Wedding Venues were too good; they had on a nice lettuce on top (not iceburg) and were such a great deal overall.